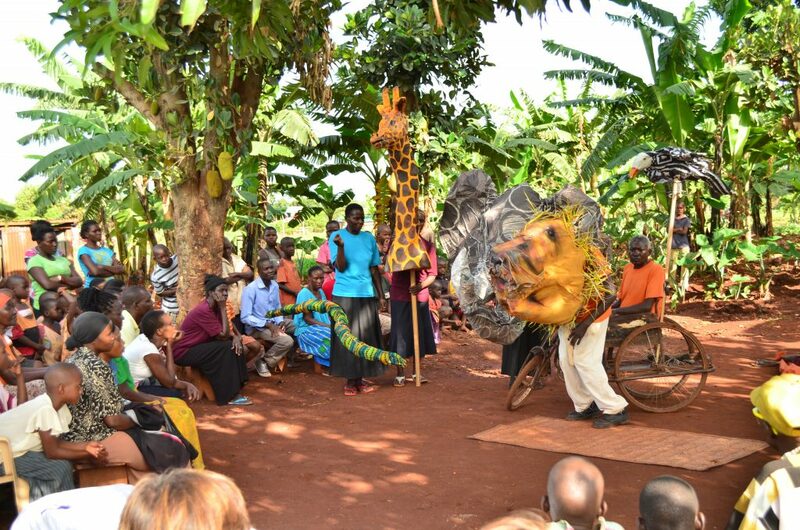 This project builds on the arts and social science activities pioneered by the Uganda strand of the AHRC funded INTERSECTION project, under the Care for the Future programme. The project worked over 20 months with 60+ volunteer members of a working class community in Walukuba, Jinja, in eastern Uganda. It built an inter-generational, inter-ethnic, inter-religious, cross-gender community group of widely divergent educational attainment; that engaged in a sustained process of embodied arts-based action research and dialogic debate emerging from locally identified environmental concerns. The project led to both horizontal – community to community, and vertical – community to stake holders and policy makers – interventions and knowledge exchange events combining performance and debate. Marked gains in community cohesion, confidence, advocacy and activism were achieved (McQuaid & Plastow 2017; film ‘We Are Walukuba’ https://vimeo.com/171216540/e04de5b695). The group registered as a Community-Based Organisation ‘We Are Walukuba’ in November 2015 in recognition of the transformative value participants ascribed to the project. This proposal builds on the unforeseen achievements, beyond original research aims, of the group and our Frierean-inspired methodology (Friere, 1970) that invoked a virtuous circle of action (arts-based embodied exploration of of issues identified as concerning the community) and reflection (group discussion of critical reflections generated by activities undertaken), and appetite expressed by the community to continue to work together and build their skills to become more effective community advocates. In consultation with We Are Walukuba (WAW) it was agreed that what the group needed in order become self-sustaining in the longer term, and to complete the transformation into a group of self-confident independent advocates for their community, was targeted training by experts in a range of arts and organisational skills. The skills needed were discussed in a series of community meetings with WAW, Plastow and McQuaid in August 2016. It was agreed these would be delivered in 1-2 week blocks where workers could take time out of work and mothers could be provided with child care. Each group of 6-12 trainees would undertake to in turn pass on the skills acquired to the wider group. The impact of this first stage of the project will be evidenced by a series of community organised performative and knowledge exchange events utilising the skills acquired. The second stage of the work is focused on scaling up the project; demonstrating how it provides a replicable model for arts-based, dialogic community empowerment, by reproducing its essential stages, learnt from the Uganda experience, over a four month period in an analogous working class community (Mtogolo village) in Zomba, Malawi. Building on the particular knowledges and contacts of our Malawian Researcher, Zindaba Chisiza, we will collaborate with a local HE partner- the Department of Performing Arts, University of Malawi, and a local arts-based NGO, YONECO. We will enable all three parties, working as equals, to mutually learn, both a new methodology for community engagement, and to share the knowledges and perspectives of all concerned about the community-selected broad topic under investigation.